We had huge success at District Proficiency Awards this year. 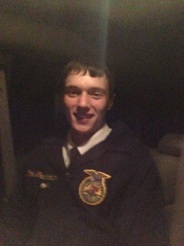 Cole Fredrickson was Selected as **Star** in Ag Placement for District 4 (he will be! recognized on Stage at State Convention). He also was the Diversified Ag Production Placement District Winner. Cameron Yoder was the Diversified Horticulture District Winner. Nate Marz won in Home & Community Development. Abbey Turner was the Specialty Animal Production Entr. District Winner. Alexa Hoffman won in Equine Production Placement. Andrew Blair won the Envir. Science & Natural Resource Management section. Reed Jostes was the Poultry Production District Winner. Gage Kapraun won in Ag Sales Entrepreneurship. Thank you to our 12 judges who made the drive to Sullivan High School to support these kids! They go and compete at the University of Illinois on April 2, 2016. Good Luck! Cole Fredrickson placed 3rd at District Job Interview and will be competing at State Convention in June. He worked hard for this contest, and continues to practice hard for State. Congratulations on a JOB well done! We have a great deal of preparation ahead. With State Record Books, District Public Speaking, Dairy Cattle, State Poultry, and much more. If you are a part of any of the upcoming events, keep practicing and working hard to stay on task. If you are not a part of the upcoming contests, look for something to do around the shop, and keep up on school work. Ag Day is also coming up, so be thinking about what you can do to help. March 17th was a good night for Section Poultry. They traveled to Shelbyville to compete in grading poultry, identifying parts, and take a difficult test. Reed Jostes placed 9th overall, while Gage Kapraun placed 1st overall. Good job to both placing in the top 10. The team placed 3rd overall. 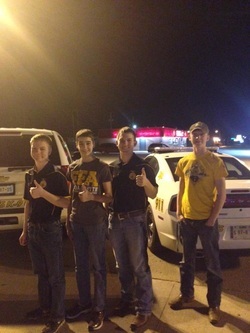 The team consisted of Peyton Ruwe, Harlan Kupferschmid, Reed Jostes, and Gage Kapraun. The team moves on to State in April. The Great American Teacher Lock Out was a success! Thank you to everyone who participated and brought in food. Congratulations to Ms. Perion's first hour class for having the most creative Frozen oriented design. We have collected 1,368 cans and boxes of food this year! It is wonderful knowing that as a school we can make a difference for a lot of families this holiday season. Each year, FFA and FCCLA along with an organized effort on behalf of all three School District Buildings collect, organize and handout thousands of pounds of food to the needy families of our school district. In 2013 over 80 families were assisted through this event. We would like thank Barb Hastings and Barb Wilkey for all they do for our communities. They are the two women responsible for the scheduling and delivery of the materials collected. They are constantly looking for help and great ideas to get resources to those families in need during the cold winter months! We will be taking donation through December 10 at the Maroa Fire Department.